Understanding your symptoms is the first step to recovering from a knee pain. Injuries to the soft tissues in your knee, such as ligaments, cartilage and tendons, are the common causes of knee pain. An acute injury means you have injured the bone or ligaments in your knee accidentally and this causes acute knee pain. If your knee pain has developed gradually over time or comes and goes, you may have a chronic injury. Osteoarthritis is a type of a chronic condition that that can affect your knee joints and causes chronic knee pain. Seek medical advice if a torn ligament or a knee pain which is very painful or swollen, giving way, clicking painfully, locking or you can’t put your full weight on it. Physical examination and other investigations may be necessary to conclude the diagnosis. An X-ray or CT scan – this may be used to check for a fracture or arthritis. An MRI scan – this is useful as it helps to show up damage to the cartilage or soft tissues of the knee after an injury. Knee aspiration – your doctor may remove a sample of fluid from your knee and send it to the laboratory for testing. Knee arthroscopy – your doctor may look inside your knee using a telescope attached to a tiny camera. 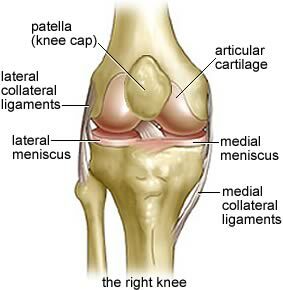 This can help show if there is damage to a meniscus, cartilage or ligament. Your doctor may treat your damaged knee at the same time as doing the arthroscopy. A BAKER’S CYST – Causes swelling in the back of the knee. CHONDROMALACIA PATELLAE – Causes knee pain under the kneecap. It usually occurs because the cartilage begins to soften. ILIOTIBIAL BAND SYNDROME – Irritation and inflammation of the band of fibrous tissue that runs down the outside of the thigh. LOOSE BODIES – Pieces of bone or tissue from a fracture or injury that may get caught in the joint and limits the movement. MENISCUS TEAR – A tear in the rubbery cushions of the knee joint. KNEE BURSITIS – Inflammation of the small sacs of fluid that cushion and lubricate the knee. KNEECAP DISLOCATION – This type of dislocation occurs more frequently in teenagers. KNEE FRACTURE – Most commonly caused by falling on the knee or when the knee forcefully hits an object. OSGOOD SCHLATTER DISEASE – Causes pain and swelling in the front of the knee below the kneecap. It is especially common in boys between 11 years to 15 years of age. OSTEOARTHRITIS – This is a form of degenerative joint disease that cause pain to the knee to be worse in the morning and improves during the day. It often develops at the site of a previous injury. Other types of arthritis, such as GOUT also can cause knee pain, swelling, and stiffness. OSTEOCHONDRITIS DISSECANS – Causes pain and reduced movement when a piece of bone or cartilage or both inside the knee joint loses blood supply and dies. PATELLA TENDINITIS – Inflammation of the patella tendon. PLICA SYNDROME – Thickening or folding of the knee ligaments. There are different types of treatment that your doctor may suggest, depending on the type and severity of the damage to your knee. CORTISONE INJECTION – This injection that helps relief pain and inflammation in a specific area of your knee. PHYSIOTHERAPY – They are a group of professionals that will develop a program of rehabilitation exercises to gradually strengthen your knee and restore its normal function. PLATELET RICH PLASMA INJECTION – Platelets have a vital role in the healing of injured tissues. VISCOSUPPLEMENTATION INJECTION – The injection supplements the fluid to your knee to help lubricate and cushion the joint. KNEE ARTHROSCOPY – This approach is non-invasive and is commonly use for repairing of ligaments or the meniscus. It can also be use to remove loose bodies. KNEE REPLACEMENT – This surgery is mostly caters for osteoarthritis knee.